Opening hours: Opening hours for shops and businesses in Bhutan are generally 9am-5pm. Restaurants usually stay open until about 10pm. 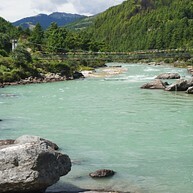 Bhutan's cultural and natural uniqueness is on full display in every corner of the country. Find picturesque mountainsides dotted with tiny shrines and temples, or marvel at the world below you from the top of unfathomably tall Himalayan peaks. Adventure-seekers will have no shortage of activities, including some of the planet's most challenging hikes and most rewarding views. Though still largely traditional in many ways, Bhutan's fascinating capital is going through something of a transformation. It remains the only world capital without a single traffic light, yet Thimphu is in many ways rapidly modernising, with several 5-star hotels and increasing numbers of restaurants and nightlife venues. 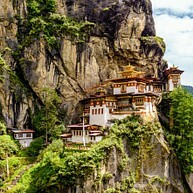 The holy grail of Bhutan's attractions is the 'Tiger's Nest' monastery, carved scenically into the side of a steep cliff, elevated at nearly 900 metres above the Paro valley. Those who endure the somewhat challenging climb will find their reward in the form magnificent vistas and access to the complex' temples, statues, and sacred artefacts. Every major community in Bhutan has its own dzong, a centre for religious, civic and administrative life, but none is quite as magnificent as Thimphu's Tashichho Dzong. Though this iteration was built in the 18th century, there has been a dzong at this site since 1216, making it one of the most important religious and political places in the country. 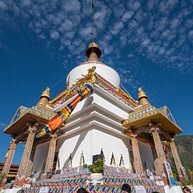 One of the country's most recognisable religious landmarks, Memorial Chorten's golden spires and bells attracts Thimphu devouts and fascinated visitors alike. This Buddhist shrine and stupa (a mound or structure used as a place of meditation) was built in 1974 to honor Bhutan's third king, or Druk. On a hill just to the south of Thimphu, on the site of the ruins of the Kuensel Phodrang palace, stands the majestic Great Buddha Dordenma statue, one of the largest Buddha statues in the world (52 metres tall). Gape in awe at both the shine of the bronze statue gilded in gold and the magnificent views of the surrounding areas from the hilltop. The walk up and down the hill takes about 1.5 hours. Punakha Dzong is the second largest and second oldest dzong in the whole of Bhutan, and until 1955 it served as the country's seat of government. Located at the confluence of the Mo and Pho rivers, it is also the country's greatest fortress, built to defend against Tibetan invasions. Adventure-seekers will find no more rewarding excursion than the Snowman Trek, an intensive 24-day hike that crosses 11 high-altitude peaks, remote villages and some of the world's greatest views. It is considered to be one of the most difficult treks on the planet and should only be attempted by experienced trekkers. Another test of physical endurance, a cycling trip from Paro to Bumthang is a 4-day, 350 kilometre adventure that gives participants a chance to experience the spellbinding Bhutanese countryside, passing peaks of 3,500 metres above sea level. Again, this is a challenging endeavor and should only be attempted by experienced riders. The Chokhor Valley, in Bhutan's central Bumthang district, boasts countless small temples and shrines dotting its hillsides. Impossibly pleasant and peaceful pathways guide visitors from one cluster to the next, showcasing the area's natural beauty. The hike is much milder than other more extreme treks, but can be a bit challenging nonetheless. Archery is Bhutan's national sport and most beloved traditional passtime. Festivals and tournaments can be found all around the country on most weekends, showcasing the great skill of the participants and the cheerful and easygoing nature of the Bhutanese people. 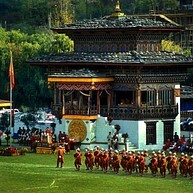 Attending one of these festivals is often one of the most remarkable and enjoyable activities for visitors to Bhutan.